"Cognitive Behavioral Therapy for Beginners provides a guided tour for delivering top-flight CBT steered by a master clinician. Dr. Wenzel sums up all that makes CBT effective, but also shows its heart by focusing on the therapeutic alliance, case conceptualization, and personalization of treatment. Whether you are a true novice or well-versed in CBT, reading this book will take you on a ride through the ins and outs of CBT in action and how to do it well." "This lovely addition to the compendium of beginning CBT books combines reflective self-practice and specific instruction to the novice. Dr. Wenzel provides insight into the thought process of the therapist as interventions are executed. Her comments on the significance of the therapeutic relationship and case conceptualization will change the mind of anyone who believes CBT practitioners are uninterested in these aspects of treatment." "I read this book as though I were having a conversation with the author. 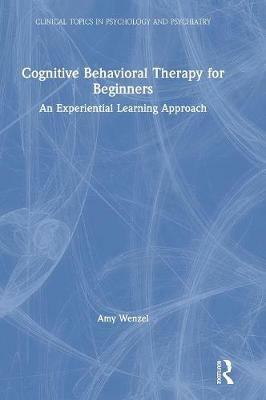 In addition to being a wonderful storyteller, Amy Wenzel makes us feel at ease, giving the reader a sense of what CBT therapists may comfortably offer to patients-that is, in her own words, `confidence about implementing interventions that will, indeed, move treatment forward.'"